How to promote a wireless infrastructure company to investors and the general public. As popular as cellular phones are, the technology behind them is still largely ignored. Spectrian, a public company that makes microwave amplifiers for wireless networks and infrastructure, wanted to communicate that without the products they make, cell phones and personal digital assistants would be unable to connect with one another. The creative team (Full Moon Interactive and Wardog Creative) determined that every Spectrian competitor used shots of their factories and products, which were usually cold, gray metal boxes and bare printed circuit boards. 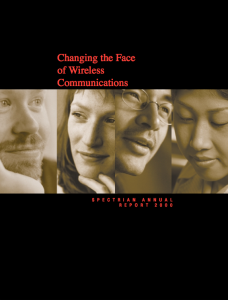 In order to differentiate Spectrian and their products, we wanted to stay as far away from technology as the client would allow and concentrate on the impact wireless communications had on our society at large.